Sandless Sandbags are light and compact. Just add water to activate. 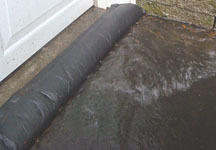 Quick Dam Flood Bags (Patent Pending) are sandless sandbags that contain a super absorbent powder that swells and gels when wet. Stack and stagger the bags in a brick or pyramid formations to increase wall height and create a barricade to protect your property from flood water. They are safe, non-hazardous and non-toxic.